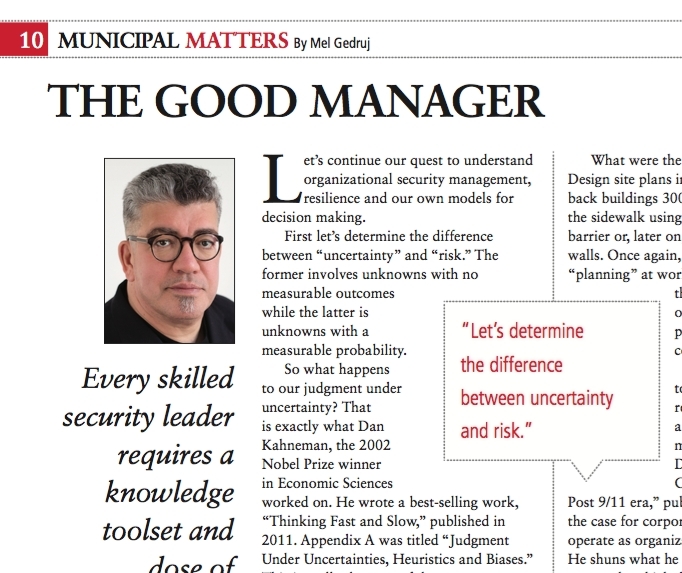 Let’s continue our quest to understand organizational security management, resilience and our own models for decision making. First let’s determine the difference between “uncertainty” and “risk.” The former involves unknowns with no measurable outcomes while the latter is unknowns with a measurable probability. So what happens to our judgment under uncertainty? That is exactly what Dan Kahneman, the 2002 Nobel Prize winner in Economic Sciences worked on. He wrote a best-selling work, “Thinking Fast and Slow,” published in 2011. Appendix A was titled “Judgment Under Uncertainties, Heuristics and Biases.” This is really the crux of the matter we want to deal with in this column. In security, the predictions we make of certain likely events are based on the outcome we have mentally envisaged. Let me give you practical examples. In the early 1980s, Richard Marcinko, who instrumental in establishing the U.S. Navy Seals Team 6, was in Lebanon on a security mission. He carried out a risk assessment of the U.S. Navy barracks and also the leader’s residence security situation. He reported in his book “Rogue Warrior” that he was extremely concerned about what he uncovered for both locations and proved his assertions by breaching the security perimeters. He acknowledged that his abrasive personality did not make for good communication and his advice fell on deaf ears. For those who still remember, about six months later, on Oct. 23, 1983, 241 marines, 58 French peace keepers and six civilians lost their lives when two suicide bombers attacked the Beirut U.S. Navy barracks. As a terrible tragedy that was seared in people’s minds, it highlighted truck bombings as the event to fear in international security situations. But, it also applied to domestic ones, which was confirmed in the 1995 Oklahoma City bombing. What were the proposed solutions? Design site plans in a such a way as to set back buildings 300 feet from the edge of the sidewalk using hard landscaping as a barrier or, later on, high precast concrete walls. Once again, we witnessed reactive “planning” at work. Instead of looking at all the possibilities we focused on what actually took place that threatened our collective peace. Many of us know of instances where planning was sacrificed to expediency and once an undesirable event occurs, sudden operational steps are taken with no regards to what we are trying to achieve. Strategic planning requires collaboration and helps the team understand and appreciate what is at stake. It builds on a rational way to develop the plan and track it later on. Members of the planning team can become the promoters of the project or the program. Again going back to Kahneman’s work, we can safely conclude that we need a serious dose of “humility” in our approach. We think we know more that we do. Mel Gedruj, OAA, CSPM is the president of V2PM Inc., specialized in municipal security management planning.